Over the last two months, I have been forced to think about monetary policy, first at a meeting of the Mont Pelerin Society (MPS, the academy of classical liberals set up by Friedrich Hayek) in Gran Canaria in early October, then from late October back in India by the continuing disagreements between the government and the Reserve Bank of India (RBI). The first concerns the instruments of monetary policy. The second, the role of the central bank and its relationship with its ‘owner’ the government. But there is another element to this story which is explained by Mervyn King (an academic who was from 1991-2013 associated with UK monetary policy as chief economist, deputy governor and then governor of the Bank of England). In his 2016 book, The End of Alchemy, he argues that the so-called ‘savings glut’ arising from the trade surpluses of Germany, China and Japan led to a fall in interest rates in an integrated world capital market. In the build-up to the crisis, this did lead in the UK to steady output growth, steady inflation close to the target of 2 per cent, and unemployment close to the estimated ‘natural rate’. But this was not sustainable, as the composition of output was distorted by the large trade deficit, which (as in the US) was absorbing the Chinese and Japanese structural surpluses. The pound had appreciated by 25 per cent with the inflow of these surpluses. Consumer demand had risen at the expense of exports. Investment had gone into non-traded goods. This real exchange appreciation needed to be reversed for sustainable growth. But raising interest rates could lead to an immediate appreciation of the pound leading to a further misalignment of the real exchange rate. So the unpalatable choice facing the UK’s monetary policy committee in the late 1990s was “between continuing with steady growth and low inflation, knowing this would exacerbate the imbalances and risk a sharp downturn later, and deliberately creating a slowdown [by raising interest rates] in order to return to a more sustainable path for domestic demand at the cost of rising unemployment and inflation below the mandated target in the short run. Not surprisingly, perhaps, the committee opted for the former” (King, ps.329-30). The US did the same. The punch bowl which needed to be taken away when on an unsustainable path was left in place, with the inevitable crisis following as John Taylor’s graphs showed. The problem of course, as my earlier column (“Guard against neo-mercantilism”; May 30, 2018) suggested, is the real exchange rate protection in the protracted current account surplus countries, and without the International Monetary Fund’s (IMF’s) scarce currency clause being implemented something like the threat of US President Donald Trump’s trade war was probably the only way to persuade the recalcitrant surplus countries, China and Germany, to change their policies. On the second issue, about the recent and continuing conflict between the government and the RBI, which has abated for the time being, a number of points can be made. First, three of Urjit Patel’s predecessors as governor — Y V Reddy, D Subbarao and Raghuram Rajan — had conflicts with the central government. The current Deputy Governor Viral Acharya’s A D Shroff lecture echoed their sentiments regarding the autonomy of the RBI. The case for the central bank’s autonomy is based on the realisation by mainstream economists of the validity of public choice theories resurrecting the ideas of classical economists of the Scottish Enlightenment that, far from being constituted of platonic guardians the State, including democratic ones, are better viewed as being self-interested, even predatory. The self-interest of democratic incumbent controllers of the State is in re-election. Easing monetary policy before an election to generate an unsustainable boom can improve their chances. This can lead to cycles in monetary policy as after the election, the pre-election boom has to be dealt with by a tightening of monetary policy. An independent monetary policy not influenced by these political factors can maintain monetary stability through these political cycles. This is relevant to the current dispute between the Bharatiya Janata Party and the RBI. I have been reading S Gurumurthy’s speech at the Vivekananda International Foundation (VIF) on “State of the Economy: India and the World”. As a member of the RBI Board, he provides clues to the source of this dispute, though no doubt what I have to say will be dismissed by him as the workings of a colonised mind! The most interesting point he makes, in a rambling, discursive discussion of various thinkers on the economy, and a wholly unpersuasive survey of economic policies and outcomes around the globe, is about demonetisation and GST. Leaving aside his absurd claims that pre-demonetisation “asset prices rose because of high denomination currencies” [notes], and the “Indian economy could have collapsed if demonetisation hadn’t happened”, he is right to say that “the MSME sector was hit by both demonetisation as well as GST. It is the sector which was robbed of credit.” This of course was predictable from the mainstream Western economics he despises. I wrote a column “Money Mischief” (November 28, 2017), which predicted the fall in growth rates from the massive three-month monetary contraction (later reversed as the new notes filled the gap created by demonetisation), and the hit on cash-dependent MSMEs and informal sector employment. It is these predictable effects of demonetisation that have led to a loss in the growth momentum and jobless growth (as the informal sector continues to provide most additional employment), which are behind the government’s demands to raid the RBI’s reserves and loosen monetary policy to provide a pre-election boom. 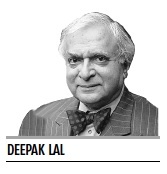 They must be resisted along with any attempt to reduce or eliminate the RBI’s autonomy.